Second-Generation Homeschoolers: Will They Be Homeschool Dropouts? Will Second Generation homeschoolers continue with the vision given to them by their first-generation parents, or will they stagnate and decay? 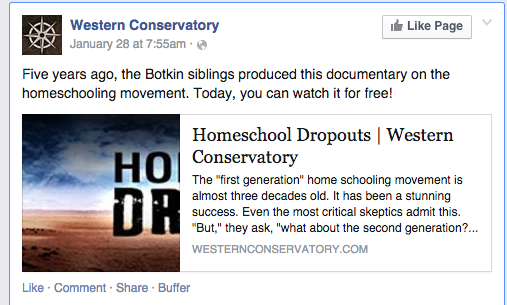 Five years ago, the Botkin siblings produced this documentary about the homeschooling movement after talking to their peers around the United States. In discussing the future of this movement, the film raised a number of controversial questions, examining the history of the movement and the character that would be required to sustain it into the second generation. Today, many of the problems addressed in this film are even more apparent. If you have 57 minutes of your precious time available, please watch. If not, I’ve done the work for you. Allow me to present my thoughts below. Please know that even though I homeschooled my kids for 10 years, I am still fairly new to people within the Christian Homeschool Movement. Julie Anne (and if Hester is so kind to offer assistance) would be able to answer specific questions about the Botkins. I still feel like I’m a bit of an outsider on the Christian Homeschool Movement. The Botkin children open this documentary by lamenting about how they are hard pressed to find anyone within their circle of friends who is willing to follow their parents’ example of Biblical homeschooling. As a result, the Homeschool Movement is in a crisis. According to the Botkin clan, the young adults of today lack direction, lack vision, are moving away from their parents’ principles, and are abandoning what their parents sacrificed so much for. Young adults need to stop blaming, take stock of their own sin and take action. In other words, this is nothing more than a propaganda film for the parents and the soon-to-be-fading leaders of the Christian Homeschool Movement. The entire focus of this video is how young adults are abandoning their parents’ views, which leads me to wonder (and wander off topic for a minute) if any of the parents’ parents homeschooled them? I would guess that the First Generation parents were not homeschooled. Wouldn’t that mean that the homeschooling parents rejected and abandoned their parents’ views of education? Why was it alright for them to move away from what their parents thought about education, but it’s not alright for their children to educate differently? When I think about our family, my children were not educated the same way I was. Was I rejecting what my parents thought was important for education? Absolutely not. My husband and I are not my parents and we have different life circumstances and decisions to make. I don’t expect that my kids will homeschool their kids. They need to make their own life decisions based upon what is best for them and their family. Since this video is more about the parents, it is not surprising that the problem with the impending doom of the Christian Homeschool Movement is the Second Generation: it is the sins of the Second Generation, not the weaknesses of the families or leaders, that are the problem. The Second Generation doesn’t seek God for ourselves. The First Generation had a desperate need for God because they came out of non-Christian homes. The Second Generation doesn’t have this desperation and displays false piety and are not truly saved. Second Generation Adults don’t take their sins seriously. They are careless, lukewarm, and hostile to God. SGAs are proud. Kevin Swanson enters the fray here (Yay!) by stating that homeschoolers talk all the time about higher test scores, admittance into good colleges, etc. However, God isn’t interested in achievements, but is interested in how kids honor their mother and honor God. The problem with this line of thought is that K. Swan and other homeschool leaders are constantly bragging about how much better homeschooling is to public school or Christian private school. At the end of this, one Botkin child says that pride is the silent killer of the Homeschool Movement. Second Generation Adults don’t engage the world. They are called to take dominion of the world (judge it, disciple it, overcome it) and Second Generation Adults are not contending for the faith. Second Generation Adults are defined by laziness and complacency. The First Generation knew that life is a battleground and that they were fighting a battle. The Second Generation doesn’t care about the war. There is no room for being laid back or pursuing one’s own interests. What will become of the Christian Homeschool Movement if the Second Generation Adults don’t follow in their parents’ footsteps? Of course, the freedom to homeschool will be lost. Statism will take over every aspect of our lives. And, if Second Gens are not homeschooling, they are not honoring their parents. I do not agree with this at all, especially since we are seeing a rise in homeschooling across the United States, as more parents are displeased with the school environment or curriculum choices. Where I work, I talk to parents all the time who are thinking about, or are new to homeschooling. Homeschooling is not going away any time soon. I think the Botkin’s concern is that if the Second Generation Adults who were homeschooled don’t homeschool exactly like they did, the chance of Christian dominion over the world fades. And, as the First Generation homeschool parents and leaders age, their influence over the second and third generation begins to fade. Growing old stinks, doesn’t it? K. Swan offers these words at the end, “I am very optimistic of the future.” He’s only optimistic if you Second Gens follow in your parent’s footsteps though. You better get busy – leading your own lives and making your own decisions! The “Homeschooling Movement”, whatever that is, may be in decline, but homeschooling is not. As regards the zeal of the so-called second generation, how is it measured? It is a hard thing to stand up to the smelly little orthodoxies of statism. Not everyone has that level of fight in them. The native Americans were always ‘Homeschooled.’. read about boarding school era. In our position we home educate to get the ‘dominionism’ aspect of what people ‘think’ Christianity is, but it actually isn’t. http://Www.sonlighteducation.com has good response to the whole matter of ‘patriarchy movements’ or ‘homeschool movements’ as they are movements that do fade…… I can venture to guess that public schools are basically good babysitters and ‘social imitation’ but not really true educators especially in social reality. Some home educated may have been around the wealthy class more than among the poor, thus decay is believed to appear. At the end of this, one Botkin child says that pride is the silent killer of the Homeschool Movement. I actually kind of agree with this, but I would say it’s the pride of the first generation/parents, not the second/children. That, and it’s not limited to conservative Christian homeschoolers. In my experience many secular/liberal homeschoolers are just as self-righteous and dogmatic about different things. The conservatives are self-righteous about the usual lineup of things we’re familiar with here (modesty, patriarchy, etc.). The liberals are self-righteous about organic/non-GMO food, natural ______ (insert just about anything else here), etc. Both groups can be self-righteous about how much better homeschooling is than public school, in every way possible (though in my experience the conservatives are worse about that). There’s also a lot of self-righteousness about one educational style being THE ONLY TRUE WAY. In my experience this is worst with classical education folks. Maybe this is just my experience, but I’ve seen a lot of orthodoxy in both camps, and shunning from both sides when you fail to conform to said orthodoxy. What will become of the Christian Homeschool Movement if the Second Generation Adults don’t follow in their parents’ footsteps? Of course, the freedom to homeschool will be lost. … And, if Second Gens are not homeschooling, they are not honoring their parents. I do not agree with this at all, especially since we are seeing a rise in homeschooling across the United States, as more parents are displeased with the school environment or curriculum choices. Where I work, I talk to parents all the time who are thinking about, or are new to homeschooling. Homeschooling is not going away any time soon. Ah yes, but unless you are homeschooling for religious reasons and in the specific way advocated by Swanson and Botkin, you are either not really homeschooling or are homeschooling insufficiently or wrong. Those non-Christians who homeschool are just jumping on the bandwagon the Christians created and don’t understand their heritage. Of course many of these same people – at the grassroots level, I don’t know about the leadership discussed in the OP – will then demand that they be allowed to take free classes at their local public school, receive tax breaks, etc. How this fits with their previous statements that public school/big government is evil/Satanic/other derogatory adjective, I’ve never understood. Why would they want to get money from Satan / send their kids to take a class from Satan? What happened to the concerns about “liberal indoctrination” etc.? Of course it’s cheaper, but you can’t proclaim that you are ideologically pure as the driven snow, and then go asking for goodies from the same people you decried five minutes earlier. I mean, you can, and there’s not automatically any legal/moral/ethical problems with a homeschooler taking classes from a public school, but it’s really hypocritical if the parent has previously said stuff in the same vein as Swanson and Botkin. So yes, homeschooling continues to exist, but its patriocentrist-approved form is on the decline (or at least appears to be), which is probably the source of much of the angst. I wonder what kind of documentary the Botkins would make today, now that HA and HARO are a thing, and Josh Harris has announced he’s going to seminary and will be sending his kids to public school. Hester: Re: “Free Classes” at government-funded institutions, Such institutions are paid for by property tax in my state. I have paid my property tax faithfully for overtwo decades, thus providing support for public schools. I don’t see how these classes are “free”. It is a hard thing to stand up to the smelly little orthodoxies of statism. Keith, that turn of phrase is worthy of Ayn Rand. I have ONLY heard the word “statism” used by Randbots. P.S. Shouldn’t that be “Gubmint” instead of “Government”? I am not a randbot, but I would be happy to accept that as a designation for purposes of good-natured fun and amusement. Ayn would not agree with a lot of my views, but I think she made some good points. I like Thomas Szasz, too, but I believe mental illness is real. I haven’t watch the video, yet. Will do when I have a chance. Hester already covered the angle my thoughts were taking me. It’s the patriarchal “Biblical homeschooling” that may be falling by the wayside (one can only hope), but homeschooling continues to grow. Since it’s now considered an alternative like a private or charter school, many parents are choosing it as possibly a better academic fit for their child versus a method of indoctrinating their child with a patriarchal worldview. Gotta love the hypocrisy of the first generation of homeschoolers rejecting their own parent’s choices, yet feeling entitled to expect their own children to follow their ideology. ‘Botkin Children” Are they still children? Aren’t they in their late 20’s? You may be right technically, but I’m only using the terminology that said homeschoolers themselves use to refer to those classes. They process them as “free” because they don’t pay an immediate out-of-pocket cost for them when they sign up – i.e., the chemistry class at the public school is “free,” while the chemistry class at the private school down the road in which it’s (say) $150 to get your student in the door, is not. In any case, my main point was that if you (general you, not you personally) have come out against public school as anti-God, and for homeschooling as a holier/more righteous/the only Biblical option, it’s reasonable to question why you are sending your children to the institution you supposedly hate – even if you do have the right as a taxpayer to send them there. Pacifists have the right as American citizens to join the military too, but most people would question their pacifism if they actually exercised that right. That’s the exact conclusion I came to. The only reason that I could come up with that it’s okay for first gen parents to not follow in their parents’ footsteps is that their parents did not have a Biblical view of education. “Biblical” according to their own view. Yes, and AFAIK still single, which is also ironic given patriocentricity’s heavy emphasis on Biblical womanhood = being solely a wife and mother. Full disclosure: I actually own the Homeschool Dropouts DVD but haven’t watched it in several years. Maybe I should break it out again and review it on my blog. Hester – That would be great! Please let us know if you do. It really is quite repetitive, so make sure you’re fully awake. Also, prepare yourself for eye roll exercises whenever K Swan enters the picture. Hester: I see what you mean now regarding the inconsistency of wanting to take a class from a system which a particular family has rejected. But I think certain classes, such as driver’s education can be nearly neutral ideologically. But now I am being hypocritical, because driver’s ed promotes the filthy habit of driving motor cars. (Insert smiley). We have homeschooled our children almost exclusively, and so far it has worked well. Surprisingly, we were denied membership in an area homeschool co-op recently. No one bothered to give us an explanation, but i suspect we are perceived as liberal and worldly, which is untrue. it is just as well, though. By not being too closely involved with some homeschoolers, I think our children have been able to avoid some of the bizarre things other folks have endured. Re: The Botkins, it seems to me a shame that they aren’t married, if they want to be. Kathi: I won’t be disappointed with my children’s decisons regarding their children’s education, unless they don’t want them well-educated. I have a couple of reasons for this. First, in that event, I will only be the grandparent. Available for advice and support, but not there to run their lives. Second, I think my children will make the choices which are best for their children, whether it be homeschool, Lutheran school, charter school, or regular public school. All I really remember from it last time was a girl who played an instrument (cello, I think?) who wanted to perform internationally but decided not to because God’s will feminism yadda yadda something. At the time my reaction internally was something like, are they really saying it’s sin to have a public music performance career? If so they’re gonna have trouble reconciling that with some of the people they like historically. Bach, for one. Playing the cello is no sin! In their defense, it may not be entirely their fault. Under their system dad may be mostly in charge of that, so if no suitors have come along that meet Geoff’s criteria (which I’m sure are, let’s just say, a bit high and very specific), then it’s no dice for them. Plus I’m pretty the Western Conservatory is basically their compound in TN, so they may be kind of isolated. Headless Unicorn Guy — As a side note, the word “statism” gets thrown around quite a bit by Religious Right figures, especially Christian Patriarchy types. They caricature the secular state as an enemy seeking to worm its way into their lives. The Botkins’ webinar series “Ready for Real Life” complained about this as well, which I found hilarious. Fundamentalist homeschoolers sequester children away from mainstream culture, teach them revisionist history and creationist pseudoscience, discourage them from pursuing degrees at accredited colleges, and in the Botkins’ case, discourage them from seeking careers in countless fields. THEN they wonder why their children aren’t more integrated and engaged with society? Gaaaaaaah. Ahab: I use the term statism in its classic sense. It has been in use for many years, long before the Neo-Patriarchs arose. Ahab: I agree with much of what you have just written, but there are a lot of people who are creationists without being isolationist. Hester – Yes, the cello girl made me kind of sad. Also, I found her speech to very very cautious and calculated. But, that may just be how she talks. I know I take a lot of pauses when talking as well. Then there was the girl from Japan, who was homeschooled in Japan, and talked about how U.S. homeschoolers are not grateful for how good they have it there. I have a friend in Japan that I want to ask if what the girl in the video claims really happens. Overall, the peers interviewed in the video are certainly a part of their group. It would have been nice to know if they did their homework and interviewed other homeschooled adults outside of their peer group. But then again, this is a propaganda video….excuse me, expository documentary. We homeschooled all our kids through the 90’s and 2000’s and now have grandchildren. Most have said they won’t homeschool their kids, but are open to it as a possibility. I’m totally comfortable with whatever choice my kids make in education ~ it’s their decision. I didn’t’ always feel that way, especially when we were exposed to the fringy parts of the movement (Phillips, Swanson, etc.) These groups were so prideful and isolationist and shunned those that didn’t believe/do as they did. Homeschooling becomes such an idol that you lose perspective and suddenly the future of the world rests with this next generation to do as these groups teach. I agree the pride is with the first generation vs the second generation. I remember listening to a discussion back in the late 90’s about how some of the “newbies” to homeschooling didn’t have the “big” picture, and that big picture included all the patriarchal trappings. It was a real concern that they would weaken the movement. I watched how some very normal homeschoolers turned into Vision Forum and Swanson wannabe’s and became leaders who steered the small co-op groups toward that kind of homeschool style. The pressure to conform was strong. I hope to see these fringy groups die out and healthier groups gain more influence as the leaders and ideas are challenged. The internet has helped tremendously in exposing Gothard/Phillips. Josh Harris NOT homeschooling and choosing to public school is HUGE. I’ve been out of the HS loop for a few years, but I see glimpses of it heading in a better direction (at least in my neck of the woods). But we’ve tried to be honest with our kids on the pro’s and con’s of our homeschooling experience. There are always regrets, but thankfully our kids have been understanding. Monique: “Homeschooling becomes such an idol that you lose perspective and suddenly the future of the world rests with this next generation to do as these groups teach.” So true! After learning more and more about these groups I developed a new mantra: Homeschooling is a choice, not a cause. Josh Harris NOT homeschooling and choosing to public school is HUGE. I agree with you – it is absolutely huge. He is going against his father, Gregg Harris, one of the original 4 pillars of the Christian Homeschool Movement. I applaud him for this. By the way, I just got back from dropping off doughnuts at my son’s 3rd grade “heathen” public school class. I loved what I saw displayed in that class among 26 students: teamwork, respect, manners, etc. His teacher rocks. I was homeschooled. So was my wife, and now we homeschool our kids. When my parents decided to homeschool me 30 years ago, it wasn’t “cool.” They took flak from their parents among others. My parents homeschooled because it was important to them that we learn from a distinctly Christian perspective and no doubt in a “safer” moral atmosphere. Call it an attempt at prolonging innocence perhaps. But they were never “in” the homeschool scene. They did it because it was a conviction, not because it was pressed on them from some celebrity. In my own kids case, homeschooling was natural to us, and we also did it outside of any input from the homeschool culture. In fact, I had no clue who Doug Philips was until a year ago. The people in the video above I have never met. And that’s not cuz we’re disconnected from culture in general, but the whole “movement” that is homeschooling is, to me, kinda weird. The thing about homeschoolers is there’s a huge spectrum of them – some are semi-Amish separatists, some are bending at the altar of huge families, some are just plain trendy people following a movement and its celebrities. Some are, like my parents, trying to do right by their kids and honor the Lord with the care of them, and see it as the best available method. All that to say, if the root reasons for homeschooling aren’t solid, the second generation will collapse, or the third for sure. Where the foundation is good, it will continue. Yes, unfortunately I had found my identity in being a homeschooling mom, not in who I am in Christ. And I wasn’t even entrenched in these Patrio groups much. I will admit to “safety” as being an additional reason for us homeschooling. But by this I mean the physical safety of my children. I know other prosecutors and LEOs who homeschool who share this concern. You never know when some crank junkie or child molester will want to get revenge on the kids of the guy or gal who charged or prosecuted them. Joe Reed: Sounds like you have turned out good! I would encourage you to keep up with some of the names/movements you will read about. There are some strange and nefarious characters who hide a destructive agenda behind homeschooling. I was thinking the same thing when I got to your conclusion, Kathi. The Botkins are not concerned with home schooling going the way of the dinosaurs; they are worried that their own particular brand of home schooling won’t survive. For the Botkins, I say: If your version of home schooling is of God, its fruit will last into the second generation and beyond; if it’s not, it will die on the vine no matter how fervently you might wish it to live on. We are Christians and we happen to homeschool. We’d homeschool even if we weren’t Christians. When I file my affadavit with the state, I list our school as non-religious. Homeschooling is simply the best option for us. My husband and I are both professional educators (though I “retired” early from the profession to be with my own kids). As far as I can see from here in So. Cal., homeschooling will continue to grow, NOT necessarily because of people like the Bodkins and their philosophy, but because homeschooling alone can cater to the unique learning style/interests/passions of the child. My kids are not sequestered in the least. The mileage on my car will attest to that. Our educational philosophy: raise up some interesting people who love Jesus and their fellow man. ◾The Second Generation doesn’t seek God for ourselves. The First Generation had a desperate need for God because they came out of non-Christian homes. The Second Generation doesn’t have this desperation and displays false piety and are not truly saved. ◾Second Generation Adults don’t take their sins seriously. They are careless, lukewarm, and hostile to God. That type of thinking reminds me of the wisdom of Gamaliel in Acts 5, but in reverse. I remember at the time Gamaliel had a reputation second only to his mentor Hillel for wisdom. When I file my affadavit with the state, I list our school as non-religious. Homeschooling is simply the best option for us. Like my one writing partner who homeschools. He’s in a somewhat isolated rural area whose schools are among the worst in his state. Another contact of mine who homeschooled did it because his (civilian) job kept him and his family moving all over the country. Love it, Lise. What a healthy balance. Five years ago, the Botkin siblings produced this documentary…Today, you can watch it for free! I might be wrong, but this sounds to me like they feel they can’t make any more money by selling their documentary. If so, I guess their exhortations didn’t do much to inspire all those Second Generation Adults. Mind you, those SGA’s might have picked up on the undertone of contempt and superiority from the Botkins (based on the synopsis provided above), which is usually bad for sales. By the way, who wrote the above post? It doesn’t seem to be Julie Anne, and I can’t find any byline. Yes, Tim is right. Kathi wrote this blog post. I jokingly sent her the link to the documentary never really intending for Kathi to actually spend that many minutes listening to it. And look at the result! I’m going to add her name somewhere in the post more prominently. I agree with you, Serving, and thought that if they are giving it away, it must be a last-ditch effort to jump on board their bandwagon. I’m certainly off that bandwagon. In fact, today, I brought doughnuts to the local public “heathen” school to celebrate a kiddo’s birthday. Every time I walk in that school, I am impressed at what a great school it is and the amazing job the teachers are doing. Tim and Julie Anne, thanks for the info! What really strikes me with this Second Generation thing is…….honestly, who cares whether the “movement” survives or not. I’m still homeschooling our youngest, but we put our two middle boys in public school this past fall. For many years, like another commenter above, I was sucked into the “this is the only way” type thinking and frankly, a shameful amount of self-righteousness about this issue. God forgive me. Regarding the “movement” I can only say that I have come to the realization that I am NOBODY’S poster child, not homeschooling, not public school, none of it. Whatever path best serves my family and children, that’s the path we will take. I’m not interested in perpetuating a movement so much as just helping them grow and mature in the best way for them. I have been hurt by the raised eyebrows and comments of my home educating friends since putting the guys in school. A few have been supportive. Others have been somewhat shocked and don’t say anything (to my face anyway…), but their silence speaks volumes. Never any inquiry about how the boys are doing or how nice it is that they can play football or be in the musical or do band or anything like that. It really hurts. But then again, I was just like them for a long time. Serving – I wondered how much they might be making off this film. Although, the Gen2 Conference hosted by K Swan was at the end of January, so it’s possible that they might have sold a few there. There’s so much of me that thinks deep down inside that these guys have such a small following that their legacy won’t last through the second or third generation. I’m sure that frightens them. Andrea – I really feel for folks who do not have supportive family or friends when they decide to homeschool or when they decide to quit homeschooling. We had one family on my husband’s side that was homeschooling and we all thought she was crazy when she started. When we started homeschooling we had a lot of apologizing to do! My family was supportive and they liked the idea that we could travel to see them any time of the year. When we made the move back to public school we had no issues with family on the decision. There’s so much of me that thinks deep down inside that these guys have such a small following that their legacy won’t last through the second or third generation. I’m sure that frightens them. I wrote a post about it, but the success of this “legacy” truly depends on daughters like Bethany’s story which was featured recently. If dads can coerce their daughters to marry someone who holds to Patriarchy, that is the only way the Botkin-brand of homeschooling movement will continue. You are exactly right. When I read your comment, I remembered (hey, it’s been a couple of decades!) that when we made the decision TO homeschool, we also experienced a LOT of nastiness from friends and relatives. I was a school teacher before that and many of my friends felt I was betraying them. Relatives didn’t understand, asked if that was “legal.” So…you are right, it goes both ways. I agree with you, lacking support in any choice like this is so sad. A good reminder for me to be supportive to others in their choices. Andrea – The great thing about our country is that we do have educational choice. Homeschooling is a great education option. The only time I have a problem with it is when educational neglect is happening. But, I would say the same for a kid who is public or private schooled. I also feel like the support/non-support of families who decide to homeschool or pull out for public schooling is the same as arguing over stay-at-home moms vs. working moms. Both subjects can bring heated debate. Instead of saying one is better than the other, why not support each other? Because in the end, one is not better than the other, they’re just different and all families work differently depending on their unique situations. Also, I noticed the menacing music in the background at the beginning. This just adds to the fear mongering that goes on within this crowd. If you’re not doing it the way they define as “biblical” then you must assume you’re not doing it “right”. For the most part, I haven’t seen the “dire consequences” warned about come to pass with our friends that chose not to homeschool. BTW, I love what Kathi said: homeschooling is a choice, not a cause. I don’t tweet, but that sure seems tweet worthy. Monique – excellent comment. And just by the fact that they call it “homeschool dropouts” leaves such a negative connotation – – that they are doing it wrong. So, I guess they are willing to call Joshua Harris (son of Homeschool Movement pillar Gregg Harris) a homeschool dropout when he enrolls his children in public school in Vancouver BC. But I want to add that I also applaud him in thinking outside the box and bubble of the homeschool community and considering alternatives that are for his family’s benefit. That film is nothing but grade A agitprop. Is it taken seriously by anyone not part of their target audience? I’m probably going to be a second generation homeschooler. I’m also a leftist atheist raised by leftist Christian parents. Probably not the kind of second generation homeschooler they’re hoping for, I’m guessing.